What did McGill Innovation Week look like in action? The fifth annual McGill Innovation Week showcased McGill’s innovative energy, connections to the community as well as to the broader Montreal innovation ecosystem. 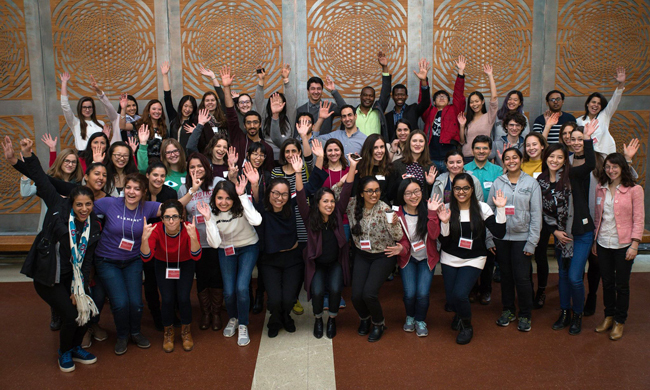 Just some of the participants in the fifth annual McGill Innovation Week that was held from November 11 to 18. At the Civic Data Hackathon, participants applied advanced quantitative and computational methods to data sourced from the City of Montreal. Students worked day and night to uncover trends in this data, including patterns to the calls made to 311, car registry data, and bike lane sensors. Check out one of the winning projects, Montreal Bike Paths, which allows users to view which paths are the busiest, while accounting for weather conditions and time of day. With the help of mentors from Montreal-based software company, Accenture, McGill students presented their creative and innovative solutions to increase diversity in companies of the future at the Diversity Case Competition with SSMU. 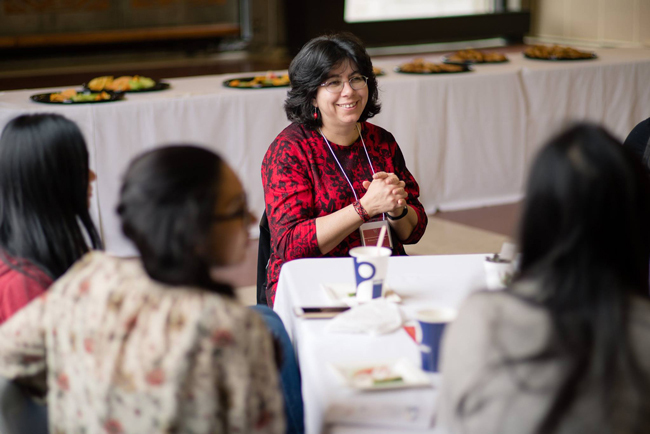 The Women in AI Breakfast brought together over 100 students to create a community where individuals feel safe, challenged and supported in discussing the future of technology. The event included a keynote by McGill researcher, Doina Precup, Head of Google Deep Mind. Layla El Asri of Microsoft Research Maluuba and Valerie Becart from Element AI also presented. Participants spent the morning with various mentors from top AI firms discussing the future of this deep technology and the importance of diversity in AI. Doina Precup,McGill researcher and Head of Google Deep Mind at the Women in AI Breakfast. WeWork offers companies of all sizes a global network of workspaces, where companies grow together in dynamic environments for creativity, focus, and collaboration. The WeWork Launch party brought together students, alumni and staff at the beautiful PVM WeWork Office for a night of mingling and tours. Students, faculty, staff, researchers, and alumni from McGill are eligible to receive an exclusive discount as new members on space at all WeWork locations in Montreal, Toronto, and Boston. Get more information and sign up online. The McGill EngInE (the Faculty of Engineering Innovation and Entrepreneurship hub) proudly hosted its 3rd annual celebration of Innovation and Entrepreneurship, an event that recognizes the growing technological innovation and entrepreneurial community in the Faculty. More than 15 awards, all funded via alumni donations, were announced, including the newly launched Innovation Fellowships, which will help researchers commercialize their inventions. In all, the teams took home over $175,000 in grants and awards, making this one of the most important start-up gatherings on campus. Get more information and learn how to get involved with McGill EngInE. The Building 21 (B21) Low-Key House Party gave guests a unique look at Student Life and Learning’s new interactive space. B21 hosted a collaborative coding workshop and provided guests with virtual reality sets to “travel around the world” with Google Earth. The night demonstrated B21’s mission to create a unique, collaborative space on campus where creativity is encouraged, beauty and chaos are celebrated, and frontiers are meant to be ignored. Wildfires in BC this summer heavily damaged the city of Williams Lake. The McGill Open Mapping Group hosted its first “mapathon” to map Williams Lake, BC, as part of the Building Canada 2020 Initiative. Together, experts and novices mapped nearly 1,500 building in Williams Lake. This information will help first responders and emergency aid workers to better locate and help the residents of Williams Lake in the future. If you’d like to contribute to the Williams Lake Open Maps, follow the link to the task, and follow the instructions on how to get going. In collaboration with the McGill’s Centre for Intellectual Property Policy and the Office of Innovation and Research, one of the highlights of McGill Innovation was the second Innovation in Context symposium. Conversations began at the previous symposium continued on how individuals, companies and firms can turn the success of a single popular idea or product into a larger environment cultivating sustained innovation. The event also focused on issues of sustainability and diversity, in particular enabling women and indigenous peoples to play a key roles in innovation ecosystems in in Quebec, Canada and the world.